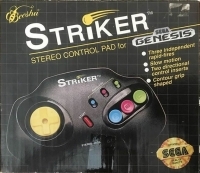 Description: The Striker Stereo Control Pad is a third-party Sega Mega Drive controller released by Beeshu. It improves on the standard Mega Drive controller in many ways, having turbo buttons, an 8-foot lead, a mini joystick replacing the D-Pad and a stereo headphone socket. This is a list of VGCollect users who have Striker Stereo Control Pad in their Collection. This is a list of VGCollect users who have Striker Stereo Control Pad in their Sell List. This is a list of VGCollect users who have Striker Stereo Control Pad in their Wish List.